We let the suspense linger for awhile, and then we called them together and explained that there were 5 gifts on the bookcase and they had 5 days of school left before break. We also pointed out the word “GIFTS” written on the board. We then reminded them of our classroom rules and expectations and that every time one of these was not met, they would lose a letter. But, if they had at least one letter left at the end of the day, they could open a gift! Of course, the first question was, “But who gets to open it?? ?” That one was easy to answer! Our class has been introduced to Ron Clark and they know all about “Runners and Riders” (if you don’t know about this, go and read his book Move Your Bus pronto!) We also use Class Dojo so students can earn “Runner” points or lose “Rider” points. We decided that they person that gets to open the present at the end of the day would be the student who earned the most runner points that day. In case of a tie, we would just pick a number between 1 and 10 and whoever was closest would win. So-we would like to spread some love and good cheer this Christmas to you! Hopefully you can use these reward cards to set up your own gift system and help you survive the last week before break. 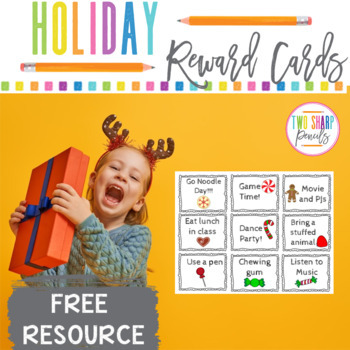 Click on the picture below to download your free set of Holiday Reward Cards. As always, we would appreciate it if you would leave some feedback love! Merry Christmas!